This kidney bean coconut curry is healthy nutritious comfort food in a bowl. Spiced with delicate Indian spices and rich coconut cream. These Indian kidney beans also know as rajma chawal can be made with canned or pre-cooked or frozen kidney beans. Rich, creamy and delicious this recipe takes less than 15 minutes. Serve it over steamed rice or with some crusty fresh baguette. How did you celebrate Valentine’s Day yesterday? Ziv and I went out for breakfast to a new restaurant. But it’s really wasn’t specific to Valentine’s Day per se. As a couple, we often spend mornings together by going out for breakfast rather than dinner. Dinner becomes really cumbersome for us because we have to find a baby sitter for the kids and not all of them are comfortable babysitting a child with special needs. Both the kids are in school in the morning which makes going for breakfast a lot more simple and easy for us. We go out for breakfast so we can spend the morning together. So this was no different and confirms to my belief that “if you spend your life with the right person, Valentine’s Day is just another day!’ Don’t you agree? 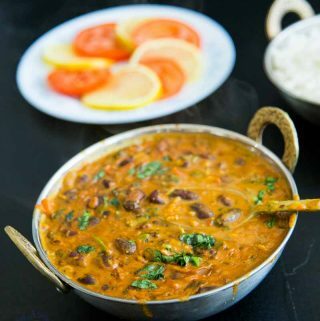 Have you ever heard the Indian dish Rajma Chawal? 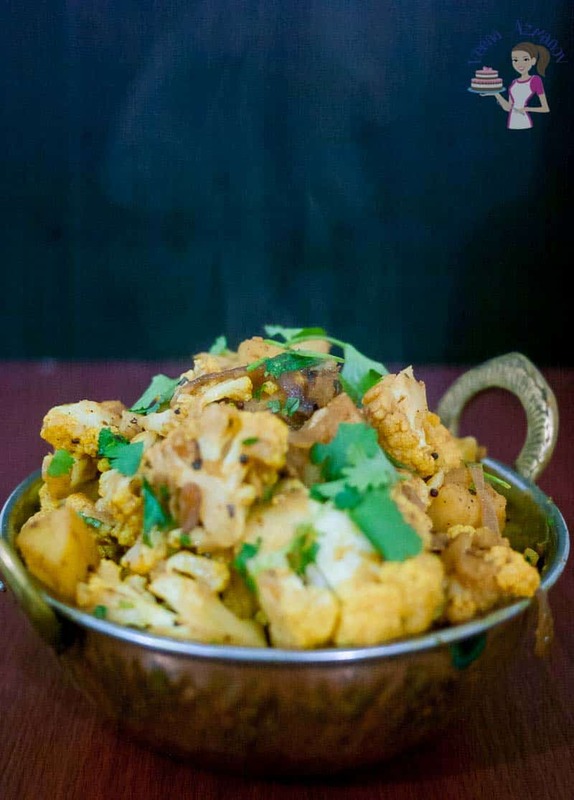 If you’ve been to a north Indian restaurant then this is often one of the dishes on the menu. ‘Rajma’ meals kidney bean and ‘chawal’ means rice. 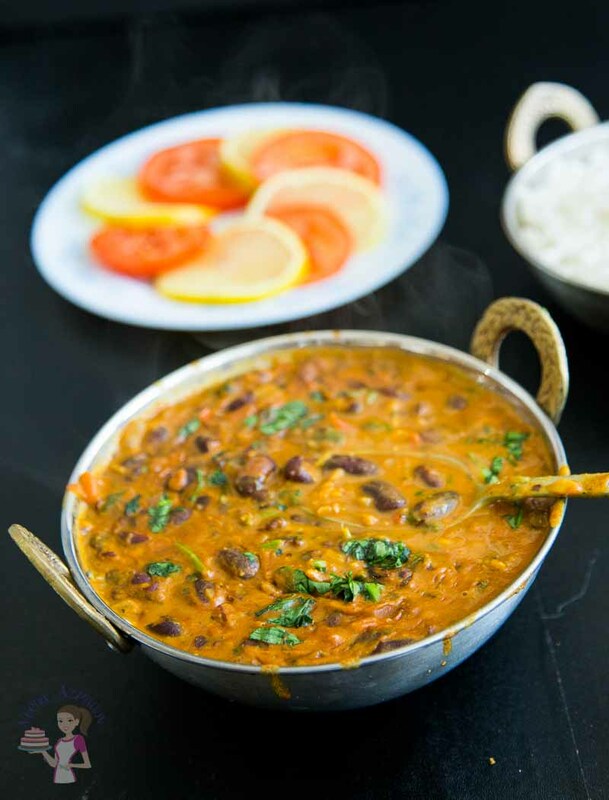 A north Indian classic dish called Rajma chawal. Very delicious, creamy, hearty and wholesome. 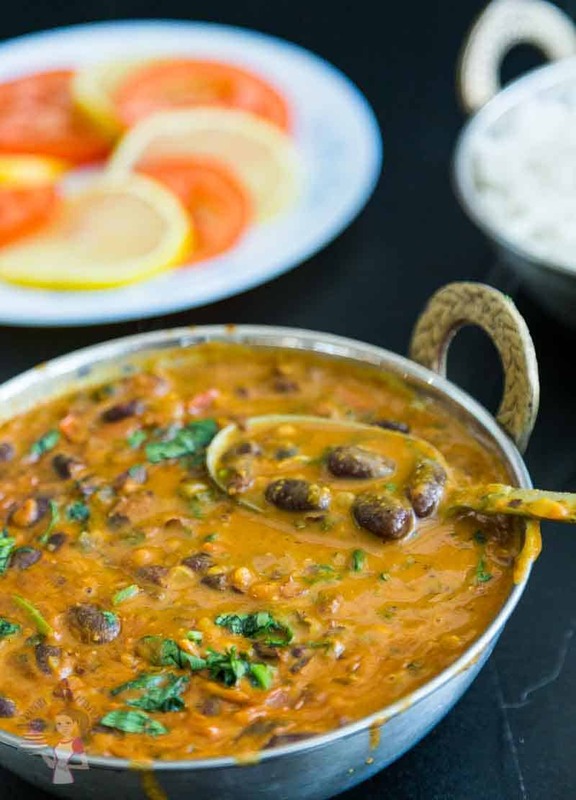 If you ever get invited to dinner by a north Indian, they probably make rajma as one of the dishes. That’s how popular and proud they are about this dish. Rightly so. The original recipe has a lot more spices like nutmeg, dry mango powder, pomegranate seeds, mace, etc which is why you will find a special rajama spice mix in most Indian shop. Recently I’ve been trying to add more lentils, legumes, beans and such in our diet and the kid’s seam to really warm up to kidney beans nicely. They love this kidney bean coconut curry which is creamy and mildly spiced with a sprinkle of fresh herbs. Aadi loves it over steamed white rice and I especially love it with my steamed cauliflower rice. Did you know that the kidney bean is the most popular among all beans? Well, they are not just popular but also very nutritious and one of the world’s healthiest foods whether you eat them out of a can or bulk bin which is one of the reasons I try so hard to get my kids into the habit of eating them often. Not to mention Ziv has issues with high cholesterol and kidney bean is a good source of cholesterol-lowering fiber for him. So I make things like my Kidney Bean Patties or add kidney bean to salads. 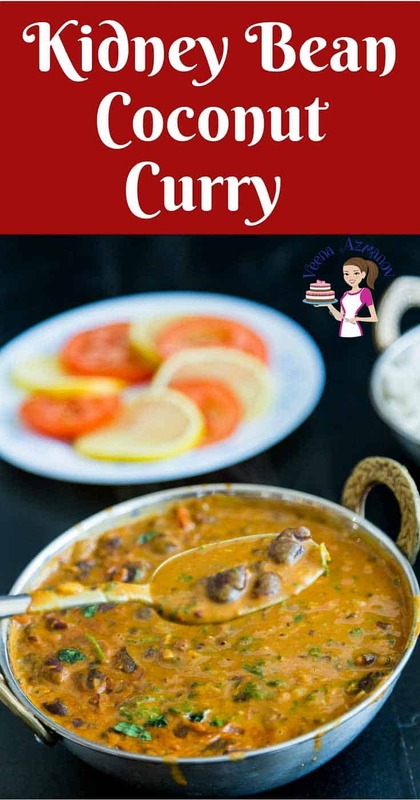 This curry is the most favored in our home and often eaten like soup for dinner with bread to soak up all that creamy sauce. As a kid I grew up eating lots of beans, lentils and such dry produce; not because they were healthy but because they were most affordable for my mom. As a single mom, she really struggled with work and home both financially and time. Buying meat often or expensive grocery was not always a luxury. Back then she didn’t buy canned goods either so it was the plain and simple method of soaking the beans overnight and then cook them in the morning. Planning was key for moms back in those days. We on the other today, are so lucky that we have so many options of canned, frozen or fresh. Right? Kidney bean – You can use canned kidney bean. I used dried kidney beans that were cooked in a slow cooker overnight without any soaking time required. This is so efficient and effective because it’s so much cheaper. I buy a big batch of kidney beans – rinse them and add 4 times the amount of water. 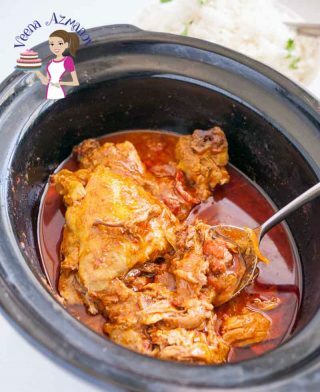 Set the slow cooker on low for a good 8 to 10 hours or until they are soft and tender. Tip- add 2 tea bags to the beans when cooking them. I do believe they cook faster and add a deeper color to the beans. My mom did it so I do it. 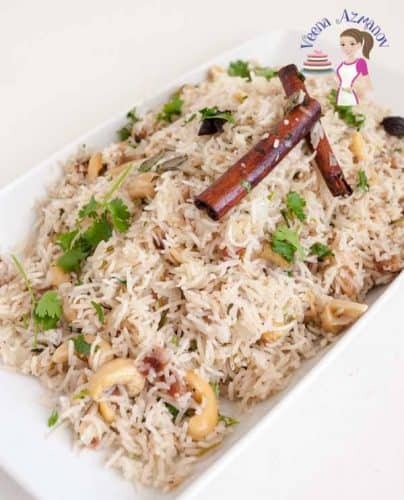 Coconut Cream – Cream or coconut milk both work for this curry and of course use fresh coconut if it’s available. Canned coconut becomes easy to have on hand. 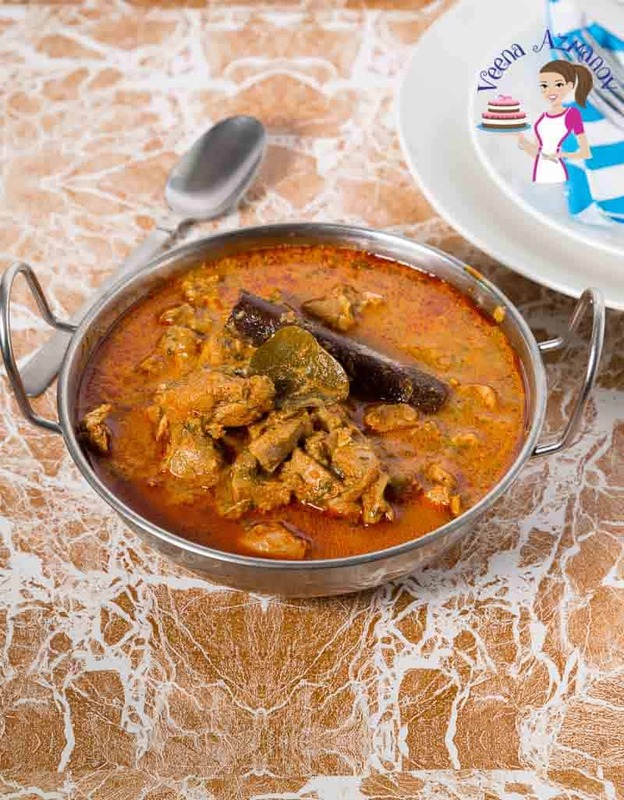 The thickness of the curry will depend on the coconut cream or milk you use. 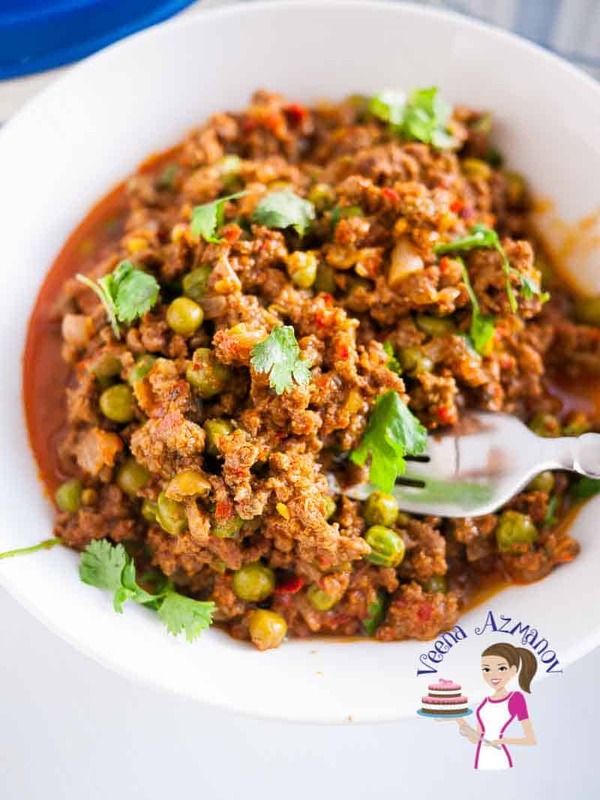 Curry Powder – This is a blend of Indian spices like cumin, coriander, turmeric, and paprika. It is readily available in most supermarkets these days. They come as spicy, mild, or not spicy. Choose one that works for you. 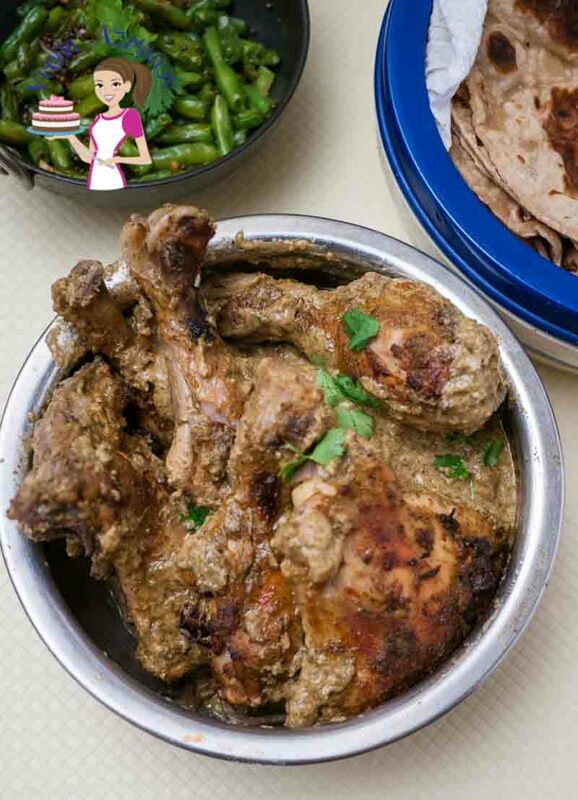 I make my own homemade curry powder which is very easy. If you like making homemade spice mixes then you probably already have some of these in your pantry. 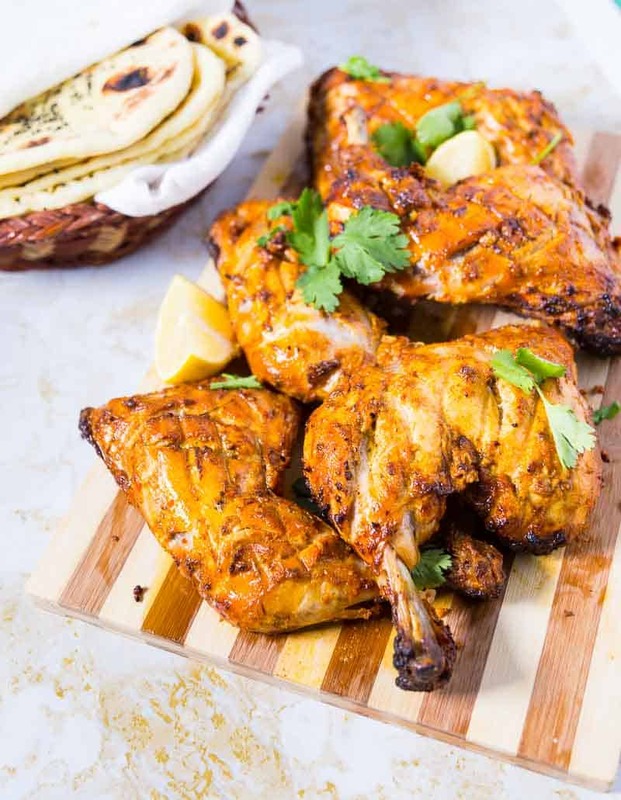 Paprika – I love adding smoked sweet paprika in addition to curry powder because I love when a curry has a deep rich color that says come eat me. If you like spicy food go ahead and switch the sweet paprika to hot paprika or try cayenne for a more spicy curry. I have to keep it mild because my kids can’t handle too spicy. Fresh herbs – A must have in all curries – these are not only used as a garnish but also as flavor. With Indian food, cilantro is the way to go. 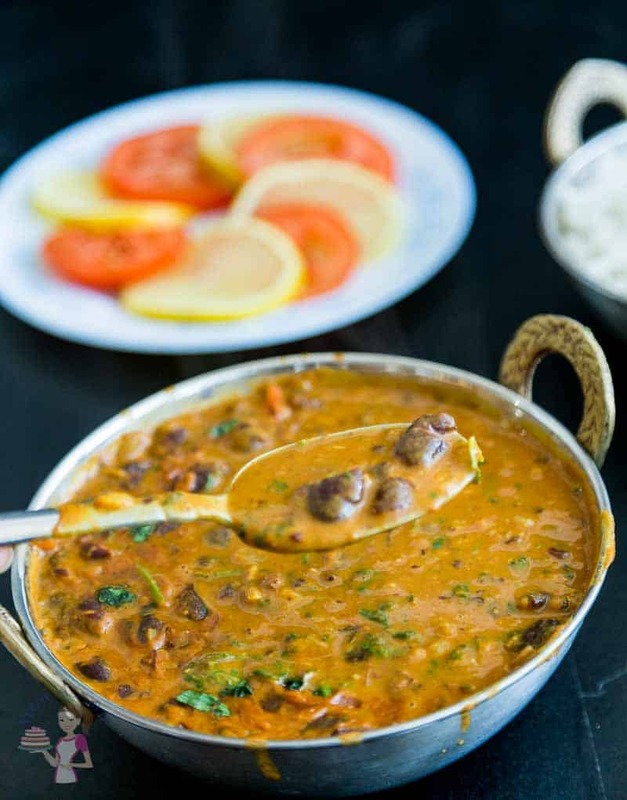 What do you serve with this Kidney Beans Curry? Traditionally this dish is always served with steamed white rice as you can see in the pictures below. Often I will also just eat this with nice crusty bread. 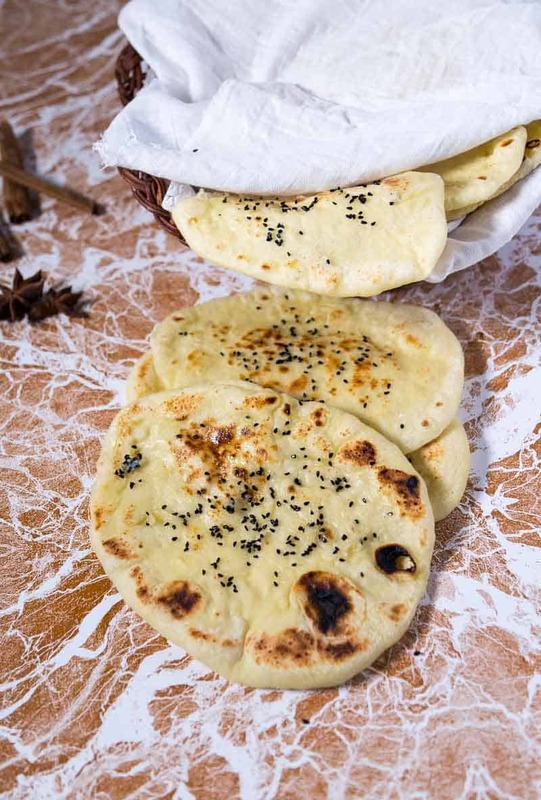 If you’re in a mood to cook Indian, the options for Indian bread are so many. 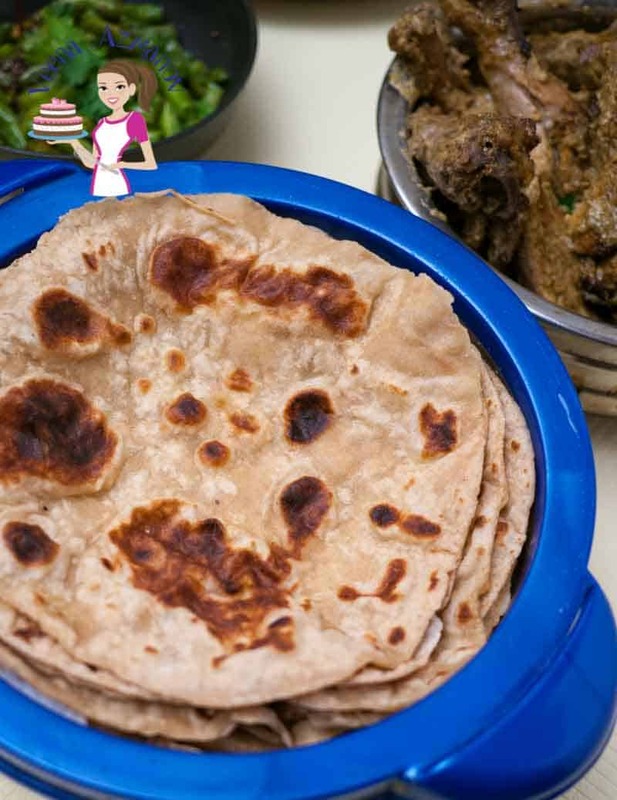 From simple chapati to exotic butter naan as well as vegetable or prawn rice. Of course, when I’m in the mood for a low carb diet then I usually serve this over my cauliflower rice, turmeric rice or mustard dill cauliflower rice. A Saute Pan is all you need to cook these beans. You can use a wooden spoon or Spatula. I perfect metalor silicone spatula as strong tandoori and turmeric can dye your wooden spoons. Unless you are comfortable and sure about quantities it is best to use Measuring spoons. That way you know you are accurate with the recipe. Add garlic and ginger – cook for a minute more. Use a splash of water (3 tbsp) to cook the spices until fragrant – about 3 minutes. Let come to a boil and simmer for two minutes more. Add Cilantro and lemon juice. 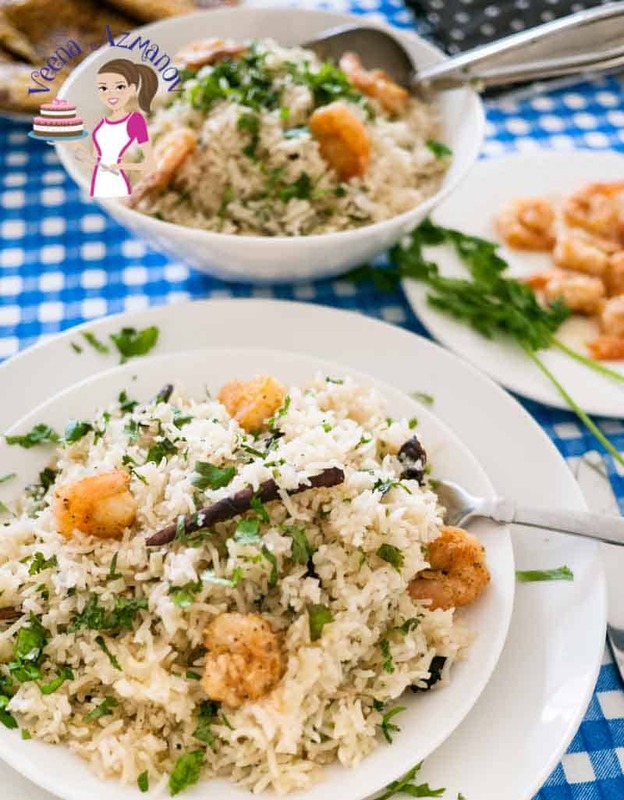 Serve over steamed white rice or some crusty bread. This kidney bean coconut curry is healthy nutritious comfort food in a bowl. Spiced with delicate Indian spices and rich coconut cream. These Indian kidney beans also know as rajma chawal can be made with canned or pre-cooked or frozen kidney beans. Rich, creamy and delicious this recipe takes less than 15 minutes. Serve it over steamed rice or with some bread. Add garlic and ginger - cook for a minute more. Use a splash of water (3 tbsp) to cook the spices until fragrant - about 3 minutes. Made this last week and it was gone in one sitting. We loved it to the last lick. So easy to make too! Thanks for sharing. Thank you Micheal. 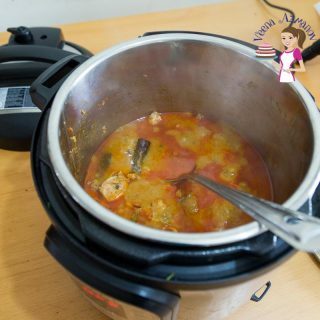 So happy to hear that you had success with this recipe and enjoyed it too. Thank you so much for coming back to write this feedback. Appreciate it so much. That sounds amazing – I love the addition of kidney beans to this. I usually use chickpeas but don’t always have them on hand. Thank you Muchelle. I do love kidney beans, but chick peas would work just as well. not just healthy but delish too. This looks so good. Perfect winter warming food and so fast to make after work. I’ll be making a double batch and whizzing the leftovers into a soup for the next day. I didn’t know that kidney beans were the most popular bean, but they’re definitely the most popular in my house. I had no idea a curry could be so quick to make, only 15 minutes! Now my biggest decision will be whether to serve it over rice or bread. Thank you Dennis. Yes it is indeed so easy to make and possible in 15 minutes if you use canned kidney beans. I love this with both crusty bread or rice. That sounds like such a great dish. The ingredients are so flavorful and we do like our beans. We don’t eat enough of them, though. I really would like to try this curry. The coconut milk in it fascinates me. And we’re pretty much like you and your Hubby. We don’t like to go out in the evenings. Instead we do lunches. I’m going to have to make some flatbread to dunk in the curry. Thank you Marisa. Flat bread or crusty bread would work a treat in this recipe. I love Indian flavors in beans and this one is really delish. You must try you will love it. That sounds like a wonderful Valentine’s Day with your honey! I personally am not much of a night person so I think a breakfast date would be much better for us. Will have to try it! I’m also jealous that your kids will eat curry. Mine won’t, but my husband and I still do and love it very much. Can’t wait to try this ! Thanks Denise. My kids LOVE curry they love eat all types of curry! They are not fond of beans except in curry form. Yeah I have come to love breakfast dates more than dinner dates now a days. We love curry. Such depth of flavour. Perfect for chilly weather!We’ve never tried kidney beans though. Can’t wait to try. PS: love the video too! We love curry here. The addition of kidney beans certainly makes this a hearty, meat free version. Perfect comfort food….especially in this chilly weather we are having in Canada. Easy and delicious….nothing better than that for a quick dinner any night of the week. Absolutely Gloria. Sure is comfort food ! We love it here on cold winter days too! I love curry!! All types are great in my book but I especially love a good coconut curry! I love the little pans your delicious curry is in!! I can’t wait to make your dish and hubby will be happy when I do as he is a kidney bean fanatic! Beautiful photos Veena! Thank you so much Elaine. I love those little dishes too. Coconut curry is always one of my favorite..! I can eat it every day. Thanks! 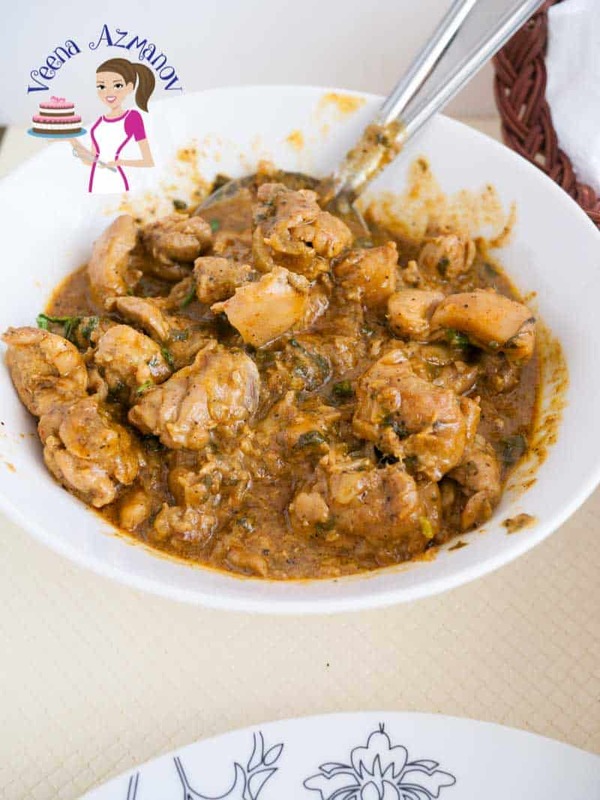 Your curry looks so delicious and easy enough to make, will try your recipe next time I make a curry dish! Thanks Patty. Yes, it is really very easy to make and definitely delish!! Yum!! I’m loving all the ingredients you used in this curry. Need to put this one on my to do list. Thanks Stephanie. Yes it’s all simple easy ingredients. You will love this one. Ooh! This looks delish! I have all these ingredients, so I am pinning this for dinner tonight! This looks like a wonderful new curry recipe to try! Thanks Sandi. Let me know what you think if you try.